Officials in the north-western Afghan province of Badghis fear that poverty fuelled by an ongoing drought is leading to rising rates of child and forced marriage. The legal age for marriage in Afghanistan is 16, although it can be as low as 15 with parental consent. A joint report by the ministry of labour, social affairs, martyrs and disabled and UNICEF on child marriage, released in July 2018, showed that at least one family member was married before the age of 18 in 42 per cent of households across Afghanistan. However, reported instances of child marriage in the household were much higher in the deeply conservative province of Badghis, at 55 per cent. Najibullah Azimi is head of child protection at the provincial department of labour and social affairs. He told IWPR that over the past 18 months they had logged around 70 cases of child marriage but noted that this was unlikely to reflect the true extent of the phenomenon. Azimi said that the current drought was a major factor, driving many families into financial hardship. Afghan grooms generally pay a hefty bride price to their in-laws, and families often cite poverty as a reason for early marriage. Zarghona Shirzad, provincial director of women’s affairs, also said that the true figure was much higher than that available to her colleagues in the department of labour and social affairs. “These figures cannot even present part of the true statistics,” she continued, explaining that most underage marriages were never reported to governmental bodies. In more remote areas, girls had no kind of access to official institutions to report their plight. In such a situation, Shirzad continued, she focused on the most extreme cases. She highlighted the case of Zargar, who was a 14-year-old schoolgirl when she was sold for 14,000 US dollars to a 65 year-old man in March 2017. 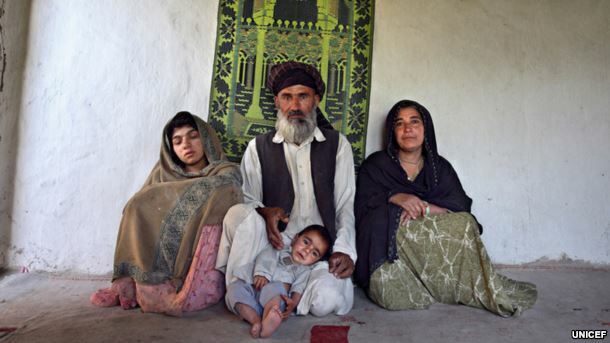 Zia Gul, a 16-year-old child, with her 50-year-old husband, Wazir, and his first wife, 40-year-old Khadija. Zia Gul is pregnant with her second child in this photo. Zargar endured two months in her new husband’s home in Qarchi village in Qadis district, until the abuse she experienced there forced her to return to her own village of Chashm-e-Shirin. “My parents had taught me that whatever my husband tells me, I should accept and follow,” she told IWPR, explaining that her husband, his brothers and even his other wives hit her, pulled her hair out and humiliated her. “They would beat me because I did not know how to cook and wash clothes properly,” the teenager said. Zargar said that she had registered her ill-treatment with the provincial department of women’s affairs and wanted local officials to help her get a divorce. For her part, Shirzad said that she had advised Zargar to stay at her father’s house until the court delivered their verdict. Zargar’s father Abdul Manan told IWPR that he now regretted selling his daughter into marriage. “Come what may, I will have my daughter divorced from her cruel husband,” he said, explaining that he had been deep in debt and felt he had no choice. “I was a rich man, and had a herd of sheep, but selling it did not fetch enough money to clear what I owed,” Manan continued. “I realized that I had nothing else but my daughter to sell and settle my debts." Even those who manage to file cases with the prosecutors’ office often find themselves unable to conclude them. Angila Sayedi, a women’s rights prosecutor in Badghis, said that last year 12 girls who had lodged complaints about their husbands’ behaviour had gone on to withdraw them. Without support from local government officials, many girls and young women are too vulnerable to pursue their legal cases. Shayesta was married last February aged just ten years old. The girl, from the village of Qarcheghi, told IWPR that her brother had sold her for 10,000 dollars to a man who already had several other wives. Her mother-in-law, sisters-in-law and fellow wives were all violent to her, she continued. Shayesta said that wanted to divorce her husband as soon as possible but needed government support to do so. “I am afraid that my husband might kill me because of the divorce issue,” she concluded. The report found that civilian deaths and injuries from ground operations surged by 54 percent making them the leading cause of civilian casualties and the biggest killers of Afghan women and children in 2014.